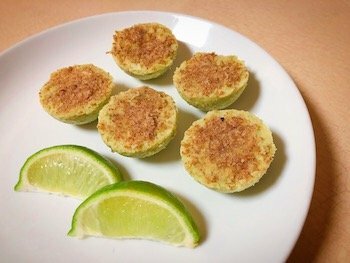 Another round of fat bombs, this fat bomb does a good job of imitating a key lime pie, hence the name. I use mashed avocado and lime zesta to help give it the nice green colour, and the mixture of lemon and lime juice helps to simulate the flavour of key limes which are more acidic then regular ones. In a small sauce pan, melt the coconut oil and butter over low heat, stirring regularly. At your stove’s lowest heat setting, whisk in the remaining ingredients (except avocado, lime zest and juice). Remove from heat and allow to cool 2-3 minutes. You want it to still be in a liquid state. Combine mashed avocado, lemon and lime juice and lime zest in a small bowl. Gradually pour in the mixture from the pot, stirring until fully incorporated. Spray your silicon mould with cooking spray (*unlike other fat bombs, these ones aren’t quite as solid so a little spray will help them hold together when you remove them from the moulds). Spoon the mixture into the silicon moulds. Sprinkle ground pecans on top of each fat bomb then gently press it in with a silicon spatula. Freeze for at least 4 hours (overnight is best). Makes 15 small fat bombs (using this silicon mould). 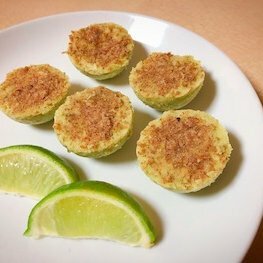 If you make these key lime pie keto fat bombs, please let me know how it goes in the comments. Or if you share pics of your creations on Instagram, please tag me so I can see them. :).